Following are some helpful river maps. There is a difference between river maps and river charts. Maps show a large area without specific details about a river. Maps are good for reference but charts provide much more information that is needed when traveling rivers. For river chart information go to the RIVER CHARTS page. RIVER GUIDEBOOKS provide the most helpful information for those wanting to travel the river, since they provide detailed charts along with full descriptions of services and interesting places of the entire river. The Wabash River is a scenic and for the most part natural river. It is the longest free-flowing river east of the Mississippi River. The huge basin or watershed accounts for it being the largest northern tributary to the Ohio River. Shown at left is a map of the river with towns and tributaries. Also shown is the river basin. 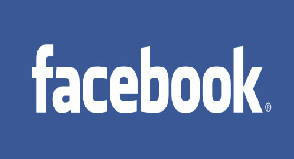 Click here or on the book to see more info about the Wabash. Click here to see more info about the Wabash. The river map above shows both east and west forks of the river, along with towns along the river. The White River is the longest Indiana river entirely within it's borders. The White River ends at Mt. Carmel Illinois where is flows into the Wabash River. The White River is part of the Wabash River Basin. 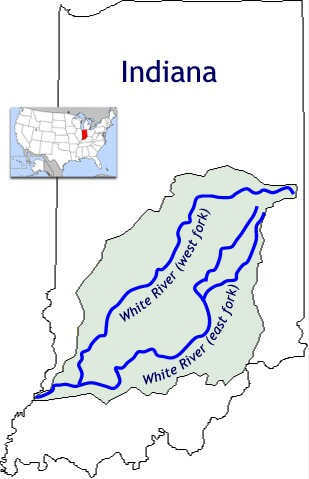 The White River basin is shown below. For more information about the White river, go to White River. Click on the book to see details about the Indiana White River Guidebook. This Ohio River map begins in Pittsburgh, PA and ends at Cairo IL. The Ohio River is 981 Miles long and has 20 locks and dams. There are many large tributaries that give the Ohio River its size. The largest northern tributary is the Wabash River. Note that on the map that north is set to make this illustration fit better on this page. The Ohio River drain basin in shown below in the lighter shaded area. For more information about the Ohio River, go to Ohio River. The Illinois Waterway is a combination of several rivers and canals that connect Lake Michigan to the Mississippi river. This waterway is important for commercial shipping and for those cruising the "Great Loop" or from Chicago to Mobile. The Illinois River basin is shown below in shaded area. For more information click Illinois Waterways. The Tennessee River is 652 miles long and has several lakes in its path, formed by dams with locks. For more information, visit Tennessee River. Also shown is the Tennessee River basin in light shaded area. Click on the book below to see information about the Tennessee River Guidebook. The Cumberland is an extremely winding and beautiful River that begins in Kentucky, then travels across a section of Tennessee, then back into Kentucky where it ends at the Ohio River. Lake Cumberland is part of the Cumberland River. This huge lake is a popular attraction for boating and tourism. Click on the Lake Cumberland map below for a larger view. Click Cumberland River for more information about the entire river. 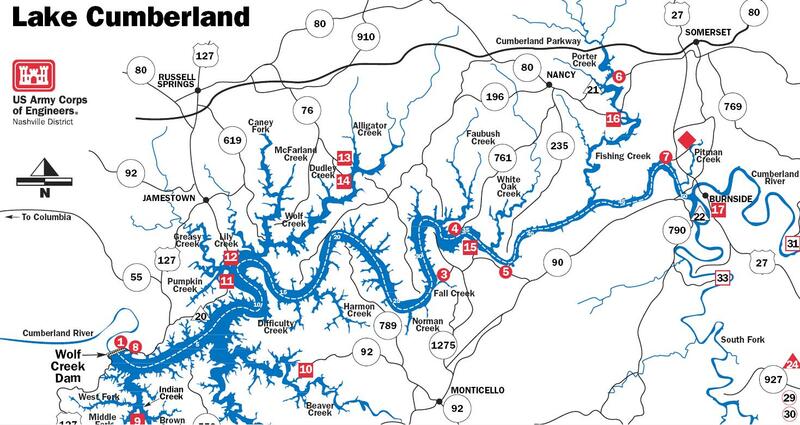 Shown below is the Cumberland River basin. 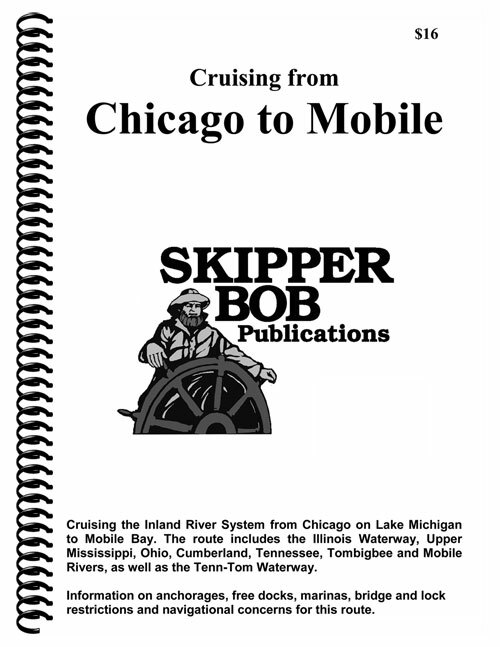 READ RIVER JOURNALS THAT INCLUDE THE CUMBERLAND RIVER AT "RIVER TRIPS"
The vast Mississippi River basin takes the rivers within the areas shown to the Gulf of Mexico. Every waterway, including the smallest creeks within the basin or watershed are connected and seeking the ocean. Click on the illustration below to see the many river charts available for the navigable rivers of the Mississippi River Basin. These maps show the Mississippi River from St. Paul, MN to New Orleans, LA in three sections. The numbers at locations are the river mile marker. The Upper Mississippi River and Lower Mississippi River have separate mile markers. The mile markers go from downriver to upriver. The Mississippi River ends in a delta that has three passes to the Gulf of Mexico. The satellite image below shows what is called Birdfoot Delta. 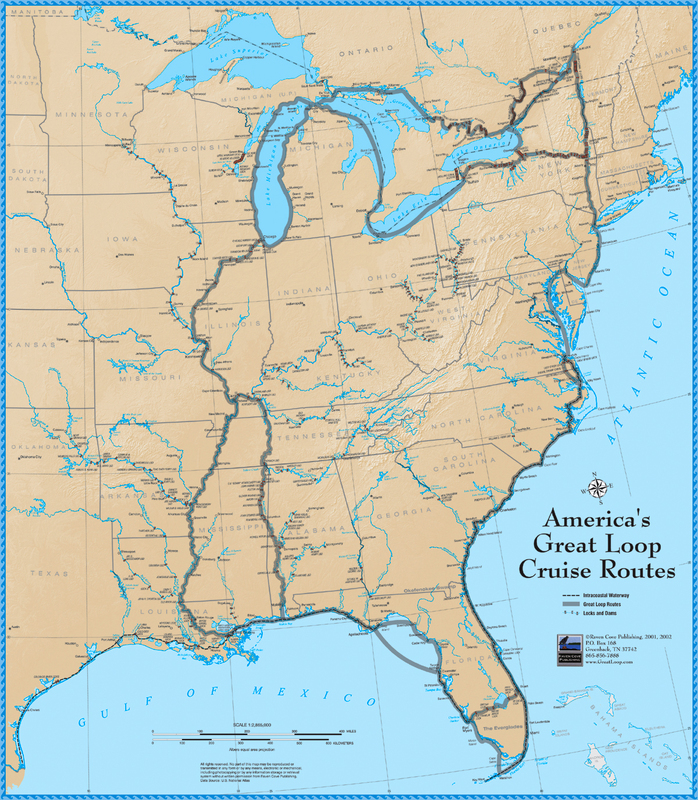 The dark lines show the various routes of America's Great Loop. It clearly shows how the waterways connect to allow people to make a trip around the eastern part of the country. One could begin a trip from any point along the loop and end up back where the trip began without traveling on the same waters. An important leg of the Great Loop is the Illinois Waterway that connects the Mississippi River to the Great Lakes. 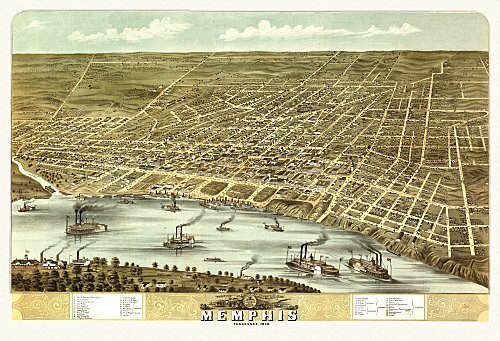 We have a collection of 229 historic river cities illustrations. These are not exactly maps but serve a similar purpose by showing a birds eye view of river cities in the late 1800s. Check them out here!